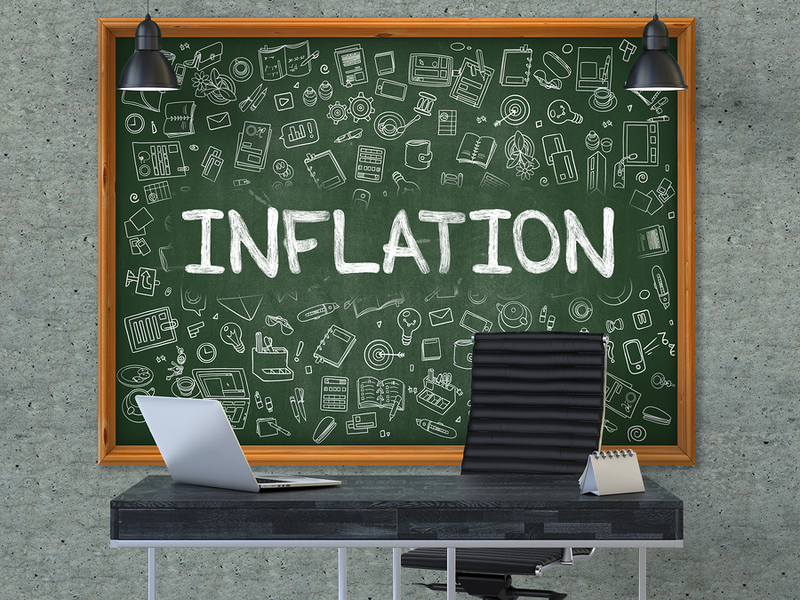 So what’s inflation all about and how might it impact your money? In 1926, a U.S. Postage Stamp cost $.02 cents. Today, a stamp costs $.50 cents. If you had $1.00 in 1926, placed it under your mattress, and pulled it out in 2017, you would need approximately $13.00 to buy what $1.00 would have allowed you to buy in 1926. That’s inflation, an increase in prices and a fall in the purchasing power or value of your money. Let’s take a look at inflation and housing prices. The average residential housing price in 1925 was approximately $6,000, according to Robert Shiller’s U.S. Housing Price Index. So, taking that 1925 housing price and looking at today’s average home value of $206,300, according to Zillow, we can see a $200,300 increase in costs for an average home. Wow! That’s about a 3,338% increase over the past 92 years! Recently, inflation has been what is considered to be “historically low,” averaging below 2% within the past decade. So, thinking of your money and investments in nominal terms has closely reflected realities and met your needs and goals near-term. However, with recent economic growth, inflation is on the rise. So it’s important for you to know how inflation today may impact your Cash, Bonds, Stocks, and your future buying power. Inflation reduces investment returns and needs to be considered in constructing portfolios for different stages of investors’ lives, this according to the Chartered Financial Analyst Institute. Most investors want their investment portfolio to preserve and enhance purchasing power. To do this, investment returns must clear the inflation hurdle. So how do the different asset classes of investments clear those “inflation hurdles” and help you to meet your needs and goals? What should you be aware of? Let’s look at Cash – in today’s low interest rate environment, with rates averaging 1.63% as of March 8, 2018, according to bankrate.com, your cash or savings typically earn less than the inflation rate, which was 2.1% as of January 2018. This means that the cash you have invested in money market or savings accounts has a reduced real return and essentially may buy less not only in the future but today as well. What to do? Consider investing in high-quality, short-term, low-duration bonds as an alternative. How about Bonds? – Today’s environment is one where the Federal Reserve Board is actively seeking to increase the strength of our economy. Policymakers have continued to raise rates, we believe, because most Fed officials are confident that inflation will strengthen as the economy continues to grow. For intermediate and long-term bonds, rising rates has historically meant a loss of principal value (lower nominal bond prices). There is an inverse relationship between interest rates and bond prices. As interest rates go up, bond prices tend to go down and vice versa. On average, interest rates have been falling over the last 30 years. This means that your bond prices have gone up! So, if interest rates are doing the opposite and rising, considering a different type of bond in a rising interest rate and potentially more inflationary environment is important. Inflation-Protected Bonds such as those issued by the U.S. Treasury (also known as TIPS Treasury Inflation Protected Securities) can offer alternatives to traditional intermediate and long-term bonds. What about Stocks? – The broad stock market has long been considered a hedge against inflation. Investing in high-quality stocks with the potential for capital appreciation can help reduce the negative effects of inflation on your future purchasing power. However, with recent market volatility, stock market investments should be reviewed. Careful consideration should be given to your timeframes and intentions for your stock market investments. Stock investments should be considered only for your greater-than-intermediate and for long-term investment horizons. Wondering what to do? It’s simple. Connecting with your financial advisor and reviewing the goals for your money in light of the current economy, inflation, and market conditions is never more important than in times like these. Making sure you have a clear understanding of the risk on your money with these factors in mind is critical, and educating yourself should provide you with peace of mind. Always consider your own personal needs, risk tolerance, and goals before investing, and keep in mind the information we’ve provided here is general and must not be considered investment advice. It is simply a beginning for you to further explore your own personal financial situation with a licensed professional who can thoroughly review your situation with you. More questions? Contact us at info@lenityfinancial.com. The CFA Institute: Investing and Inflation: Time to Protect your Future?